Sauna vs. Steam Room – Which One is Best for You? A steam room is a high humidity chamber that heats water to create vapor. 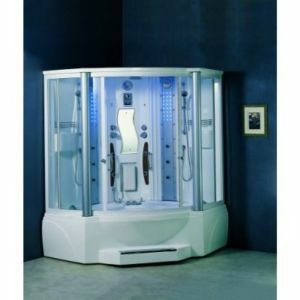 (See Steam Shower Sauna). A sauna is a low humidity chamber that uses hot rocks (or even infrared rays) to create a high, dry heat. 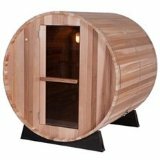 (see Finnish and Infrared Saunas). If you use one or both of these hot rooms at the health club, you may have developed a personal preference for one versus the other. Some people use either the sauna or the steam room as a treat - a session of relaxation after their workout. That approach is fine but you should know that these heat therapies offer so much more! For one, a steam room does more than just open the pores and ease breathing. First of all, just like a sauna, it makes you sweat which is a necessary function of the skin. Sweat contains urea, the same stuff in urine, so it’s beneficial for the body to sweat out toxins and other impurities. The steam room uses a generator to heat water and disperse it in the air creating 100% humidity but at a much lower temperature than a hot rock sauna. One confusing problem in the sauna vs. steam room debate is that saunas are often described as being dry or wet. In a hot rock sauna, the result is high temperature (up to 200° F) and low humidity (about 10%). In a “dry” sauna, the high heat is well-tolerated by the body because perspiration evaporates quickly without humidity present. 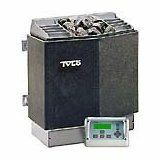 In a “wet” sauna, water is poured on the hot rocks and the vapor raises the humidity of the room up to 20%. You can also add aromatic fragrances to the water you apply to the rocks adding yet another benefit of the “wet” sauna. Both the steam room and the sauna create the desired effect of creating a temporary fever, or rise in temperature in the body, a process called hyperthermia. Both serve the needs of different groups and it’s important to learn them in your sauna vs. steam room decision. 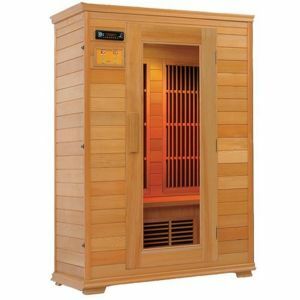 If you have respiratory problems and allergies then the steam room is generally the better choice versus the sauna since the moist air will help to clear sinuses and airways. The steam inhalation is also effective on sinusitis, bronchitis, asthma, even coughing, or any malady which can be relieved by moisture in the air. Even though the temperature is hotter, the body is better able to effectively dissipate its body heat in a sauna vs. steam room environment, because the sweat will evaporate in the hot dry air of the sauna. 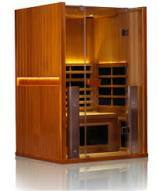 The body cannot cool itself as effectively in a steam room because there is no evaporation of the water vapor. To get a better idea of this, imagine being submerged in a Jacuzzi or a hot bath, where heat loss through evaporation is impossible due to total water saturation. 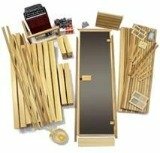 That’s why a hot bath of 100° F feels much hotter on the skin than a sauna with a temp of 180° F.
The sauna is generally preferred over a steam room for those who can’t tolerate hot humid environments which would include people who suffer from acute rheumatoid arthritis, acute infection, or active tuberculosis. Furthermore, because of the increased cardiovascular activity, people suffering from heart ailments should talk to their doctor before using the steam room. In the sauna vs. steam room debate, both get a “thumbs up” for aiding the overall health of the skin as well as improve respiratory and circulatory benefits for people that exercise, as well as those who don’t.